You want more distance. You need more speed. Here's how the math works: for every mile-per-hour you add to your driver swing, you can tack on three extra yards off the tee. You can gain 10 mph simply by swinging past parallel. That's 30 extra yards! Getting past parallel (as I'm doing here) isn't about extending your arms back higher or farther, or forcing a shoulder turn your body isn't capable of making. 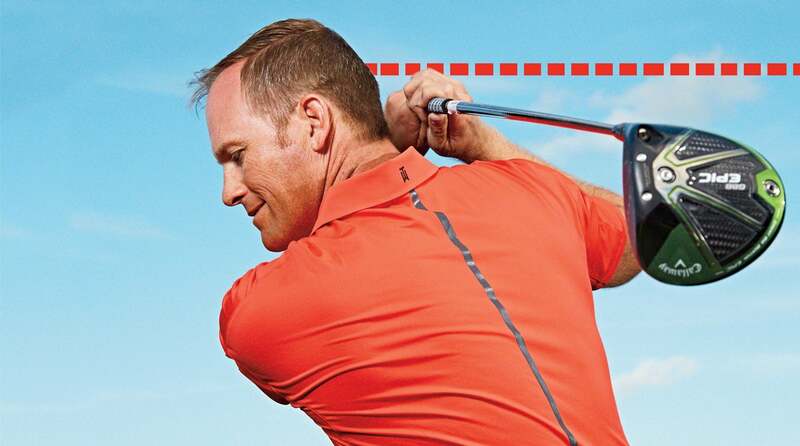 Your key: Become "softer" at the top of your backswing. Allow your wrists to hinge fully and your elbows to bend a bit more than normal. It should feel like the clubhead is "dipping" a few inches at the top. That little dip means your driver has to travel just that much farther to get back to the ball, giving you extra time to build speed. The idea is to reach max velocity when the clubhead meets ball. Now go hit it like you mean it!